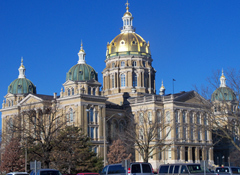 The Iowa legislature has voted to make it easier for those wrongly accused of crimes in Iowa to get their records cleared. Representative Mary Wolfe, a Democrat from Clinton, says people would be surprised how many Iowans are going to be affected. The bill sets up a process for those wrongly accused of a crime to have the court records “expunged” — a legal term that means erased. Representative Sharon Steckman, a Democrat from Mason City, says this will help a woman in her area who was charged with a drug crime, but police soon determined it was a case of “totally mistaken identity” and they were looking for someone else. Representative Chris Hagenow, a Republican from Windsor Heights, says it’s an example of bipartisan agreement — since the bill passed both the House and Senate without a dissenting vote. The bill got final approval in the House Tuesday. Senators gave it a final vote today and it’s headed to the governor for his review.